I have never met someone who does not hold the belief that education and success are directly related to each other. Take that a step further: an educated population is successful… Therefore grows in sustainable ways, nurtures, and takes care of itself. The largest surges of progress in mankind have been the products of a new level of education for the population. You would think, in that context, that education of the population would be a priority as a civilization. Last week I had the opportunity to take a look at the Dallas public education system. As far as quality of life goes, the biggest problem with Dallas itself is the school system. Around here, if one has a choice, I see typically people do one of two things: move to the suburbs or choose private school (or both). Issues with the school district seem vey amorphous. The city government has no bearing on the school districts (however, in this afternoon’s city council meeting, they proved they have reaching arms in zoning and other secondary means); the district receives funding from all levels of government, but remains pretty much autonomous. Term “Independent School District” really is true. The leadership is made up of elected officials called trustees. Each of those trustees manages a number of schools based on their district. Other than meeting set levels by the state, that’s pretty much it on the oversight of the school district. I’m oversimplifying, but that’s not the point of this post anyway. We saw two schools of the extreme opposite, but two that are headed in the right direction. One extreme was an urban school with strong leadership. The principal had made numerous changes that would be simple in the private world: identify a problem (soda and candy machines causing problems in the hallway), and fix it (remove them!). This practice filters down to the staffing of the school – she kept only the better teachers, weeding out the ineffective ones. The result? Grades are up. Test scores are up. Morale is up. The students like being there – in fact, they treat the school as a safe haven for what goes on around them. The district gives the principal so much control over a school that they have the ability to make a real difference. That’s great – when you have a great principal. The other school we visited was an elementary school nestled in a more upscale area of Dallas. This school is nationally recognized and has made a huge turn around in the past five years under the direction of their principal. Click on the image for some interesting statistics. The main difference between the schools was this – the elementary school had great support of the parents. The leadership of their PTA actually came to talk to us! Again and again, the point was proven that the school did well because of the parental support. Budget gaps were being mitigated through parent volunteers, needs were met by reaching out to parents through email and social media, and the group in front of us were dedicated to the education of their children, which showed in the pride of their school. The high school, on the other hand, was turning around despite the lack of support of the parents. During the principal’s presentation there, she made no mention of parents (other than the fact that many of her students were being raised by grandparents). As a matter of fact, she repeated the point that the school was a “safe haven” for the kids. You could tell by her demeanor she was doing a lot more heavy lifting than the elementary school leadership. A trustee member came and spoke to us as well; I had met her a few years earlier when she had applied for a grant for a summer school program she leads. She drove the parent support factor home to me during that first interview. She told me a few stories of how clueless the parents were about how to simply behave around their kids, much less support them In school. One story that stuck in my mind was her having to tell parents, as they were dropping off their kids to a summer program – “hey! Don’t smoke weed in front of your kid!”. Quite a big contrast from the PTA group we met at the elementary school. Click for notes on the search for a new superintendent (also source). The trustee discussed some of these issues from her side of things. Unfortunately, her primary issues revolved around budgets. Again she would circle back to the kids, and her main task at hand was dealing with a dwindling population (people are fleeing the school district for the ‘burbs), heavy overhead, lower local tax revenue and lower support from the state and federal levels. 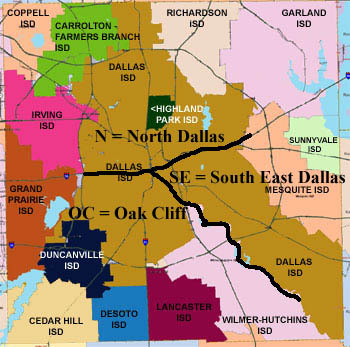 This will involve closing schools in certain areas of Dallas, which unfortunately makes sense – the population of south Dallas has dwindled 5% in as many years. She said the district had done it before, and maintained the schools until the population rebounds. However, huge emotional issues arise with mothballing schools, and the district is running into public pushback for such actions. However, even by saving $10 Million per year closing these schools (the cost of each child in a low population school rises exponentially), they are still dealing with a $30 Million shortfall all while trying to maintain their current programs and services. They are still quite far from closing that gap. We touched on bilingual education as well. Apparently, the state gives more funding per student for a bilingual education; however this education does not prepare kids for college at all. In an entrance survey, a parent has to check a box for their “home language.” if that box is checked anything but English, off they go onto a different track, one the school is incentivized to use since the state provides so much more funding. However, the trustee brought up a great point: the SAT, ACT, LSAT, MCAT… they’re in English. Putting children down a non-English path does simply not prepare the child for college. The school district is supposed to do something that seems fairly obvious: focus on the child. Recently DISD has made many changes that are apparently considered “anti-teacher” but seem fairly obvious to me, such as trying to change compensation from seniority (how long have you been there) to performance (how well are your children doing). That seems, from the private world, fairly obvious. That sounds harsh, and I’m sure there is a valid opposite argument… but that is what many people from the outside see. The trustee gave an example of a confrontation she had with someone when a teacher was released. She turned to the fellow teacher and asked; “do you want her teaching YOUR child?” the other teacher went silent. This rift sounds so conflicting to me: apparently pro-child means anti-teacher. I don’t get it. It seems like we should all be headed in the same direction. The district has many amazing programs: the magnet schools, the prototype schools, new ways of teaching teachers, and charter schools. They have some amazing stuff going on, and yet mostly we hear about the negative. Look at this post! Perhaps eventually I will talk about the positives. One has to dog to find that, and I have just scratched the surface. That, and recent events in my life keep my mood down. So much to carry on about, but this post has gone too long for one. Until next time.